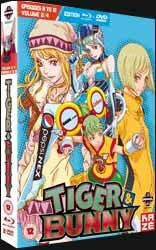 This second set of Tiger & Bunny episodes resumes the story from the climax of the previous volume, with super-heroic duo Kotetsu 'Wild Tiger' Kaburagi and the non-pseudonymous Barnaby Brooks Jr., nicknamed Bunny, facing the newly emerged vigilante Lunatic, a ruthless killer whose unnerving costume continues the series' knack for brilliantly memorable character design. Lunatic's penchant for executing criminals is sufficient reason for our heroes to face him down, but Barnaby has a more personal motive: the underworld organization Ouroboros, who murdered his parents years earlier, are being targeted by Lunatic, rapidly reducing Barnaby's chances of finding the culprit. Of course, since image is everything in the media-savvy world of Sternbild City's heroes, Lunatic's appearance prompts Hero TV's sponsors to launch a publicity campaign to reassure the public, throwing the spotlight for the first episode in this set on unconfident second-stringer Origami Cyclone, whose spectacular yet seldom useful superpower generally reduces him to showing up in the background of other people's fights. The following episode focuses on the plucky tomboy Dragon Kid, whose self-confidence and success rating are rather higher, but whose management seem to be more worried that her image isn't girlish enough – the cue for some slightly troubling gender politics as Dragon Kid protects a kidnapped baby and learns to embrace her feminine side. Both episodes, while nominally centred on supporting characters, rely heavily on Tiger and Bunny's intervention to resolve matters, and it's a shame the show seems not to have the confidence to let the charming secondary cast shine more. That's a concern that has to take second place for now, though, as the final four episodes in this set ramp up the plot and return the focus to Barnaby's quest for justice, as the Ouroboros organization finally make their move, placing the city under siege and demanding the release of the psychopathic killer Next, Jake Martinez – coincidentally the number-one suspect in the unsolved murder of Barnaby's parents. Jake's a consummate comic-book supervillain, obviously reminiscent of the Joker in his relationship with his adoring female subordinate, but flamboyant enough to pull off his turn as Tiger & Bunny's biggest antagonist so far. While the English dub continues to be of excellent quality, it's worth switching to Japanese simply to hear veteran voice actor Keiji Fujiwara's superb performance as Jake: his interactions with the hapless hero sent to infiltrate his operation have a menace the English dub just doesn't match. Tiger and Bunny's efforts to defeat the seemingly invincible Jake and save the city, while divided by their own differences and Barnaby's loss of faith in his partner, form the climax to this volume and T&B's first season; while never exactly surprising in the ways either the plot or characterization are resolved, it's still a tremendously entertaining show. Kazé's package for Tiger & Bunny volume two is a luxury affair in keeping with its predecessor, with booklets and hero data cards doing full justice to the wonderfully fleshed-out world of Sternbild City, which has its own architecture, fashions and advertising befitting a super-heroic metropolis. With only six episodes on this release, the extras go a long way to justifying the high price to content ratio, although anyone who can remember the days of paying the same price for three or four episodes per release will be more than happy. It's an excellent package from Manga and continues to be one of the most enjoyable series this year.